I have done quite a bit of traveling since I started having kids, and some people ask me...how do you do it? Well, many other military, space-A flying mommies out there have perfected this task as well. After a few flights, you have a system worked out, and the whole travel-by-plane-with-kids process becomes quite easy. At first, I would accept help from strangers in a second, but now I'm like, "No thanks! You'll mess up my balance if you take one of those five bags from my right arm!" Ha. Okay, that was a bit of an exaggeration. Having flown both commercially and military with kids (by myself) multiple times, I must say that I prefer military flights. They are free, which is awesome, but more importantly, I will never have to fly with a lap baby on a military flight! Each child having their own seat makes life so much easier (and ALMOST worth the cost of an extra ticket on a commercial flight). Anyway, I'm going to attempt to explain my process here. 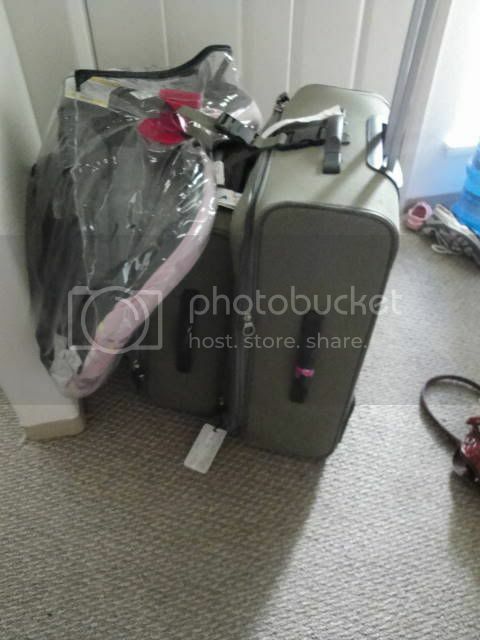 #1 Have a luggage set that connects. 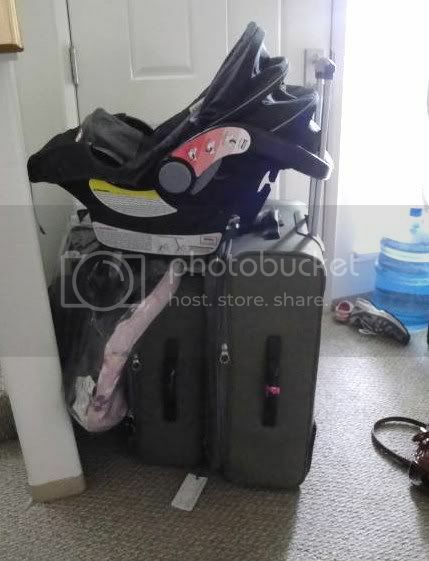 Or, just take one suitcase (One suitcase would be ideal for commercial flights that require you to pay for extra baggage--for military flights I'm allowed 2-70 pound bags per person, including both kids...so I could check 6 suitcases for free if I felt like it). I have never been a light packer, so I have to have the connecting luggage. 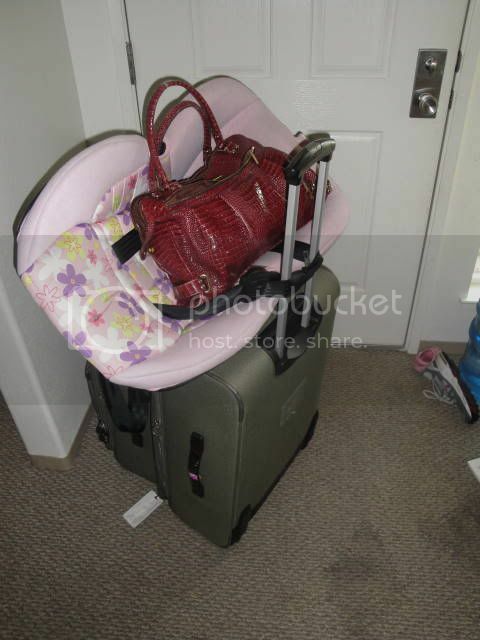 Big suitcase for me, little suitcase for the kids (toys, books, clothes, shoes, diapers, blankets,kid toiletries, etc). 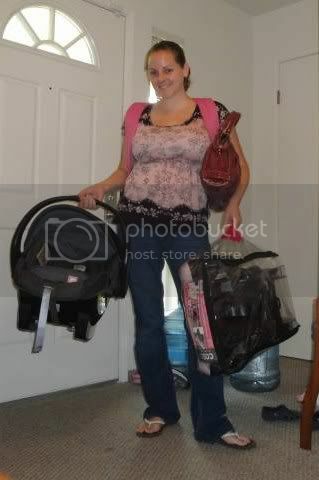 #3 use a backpack instead of a diaper bag or purse. If you want a purse or diaper bag for your destination, pack it. I usually put my wallet, phone camera, snacks, toys/books, bottles of water/juice, diapers, wipes. blankets and changes of clothes for me and the kids in the back pack. 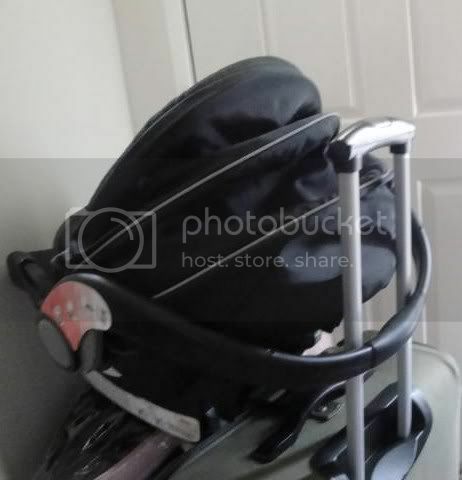 I highly suggest using a carrier car seat for children still under the weight limit, because it is just easier than carrying a child AND a car seat separately after the stroller and bags are checked. Of course, if you only have one child and are traveling with them on your lap, then you would check the car seat, use a baby carrier, and this wouldn't apply to you. 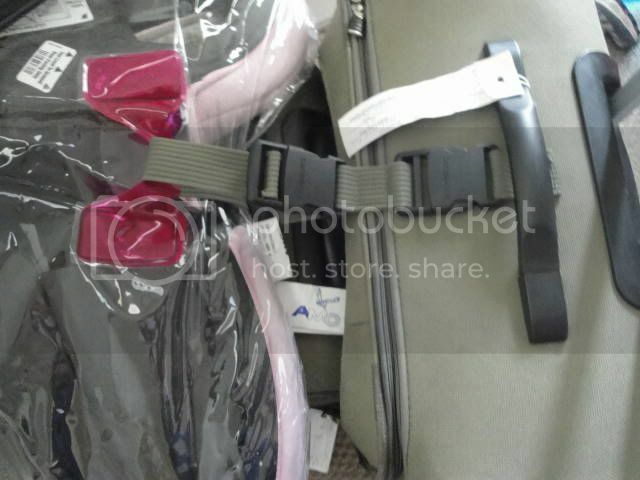 But for those who fly with car seats, I have even found ways to hook a car seat to my backpack effectively. 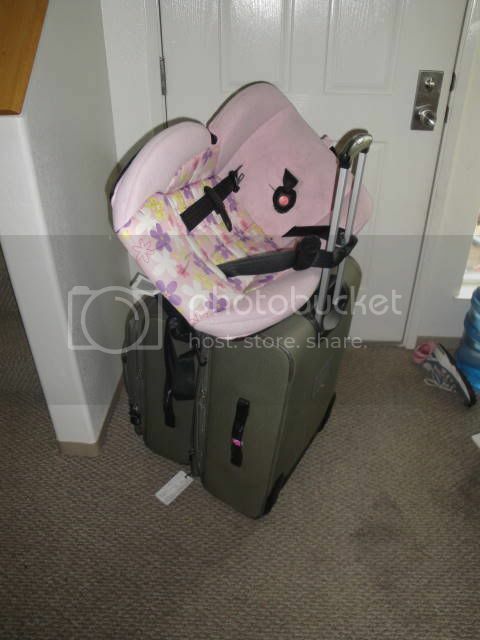 It can all look quite overwhelming when you see how much you plan on traveling with alone (car seat(s), stroller, suitcases, backpack, KID(S)), but once you have a system in place, it is quite manageable. When Jocelyn was seven weeks old, as soon as we got her passport we hopped to Korea and back which was SUPER easy because Jocelyn had her own seat on the plane, I only had one kid, Melynda came with me and that helped a lot, and it was only a <2 hour flight. Then, in the month following our return from Korea, we hopped from Tokyo, to Korea, to Okinawa (stayed the night), to Guam (stayed the night), to Hawaii (spent a week in Hawaii with Brad while his ship was there), to California. Then we bought a ticket to Nebraska and spent a total of 11 hours on the ground in California (enough time to consolidate into one suitcase and drop everything else off with Kylie) before heading to Omaha with nothing but a backpack, a baby carrier and one suitcase (oh, and the baby). I left the car seat, stroller, and big suitcase in Kylie's car, and flew with Jocelyn as a lap baby (which is easy with a 3 month old, but not exactly recommended with a 13 month old--been there, done that on an eight hour international commercial flight and never doing it again). We stayed in Omaha for a week, then flew commercially back to California for the Tjerrild Family Reunion, then got on a military hop back to Japan. 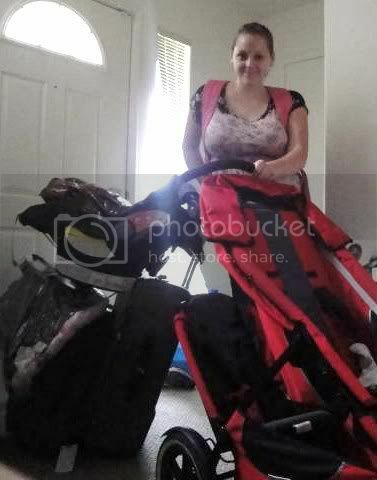 I had to deal with evicting the renter in our house and hiring a lawyer while I was in Nebraska, and I was taking classes online full time, but I still managed, lugging my books, heavy dinosaur of an old laptop, and the breast pump in addition to my normal stuff. So that wasn't too bad. I think that maybe the fact that all that airfare (Japan to Korea to Okinawa to Guam to Hawaii to California to Nebraska to California to Japan) only cost me $400($200 each way from CA to NE and back), made the travel so much more enjoyable. But...now I have TWO kids. I got my first solo travel experience with them when Sam was about five weeks old...and it went quite well! We hopped back to California for my brother, Burt's wedding, looking like you see me in the above photos (exactly the same unfortunately because I haven't even lost ONE pound since Sam was five weeks old). 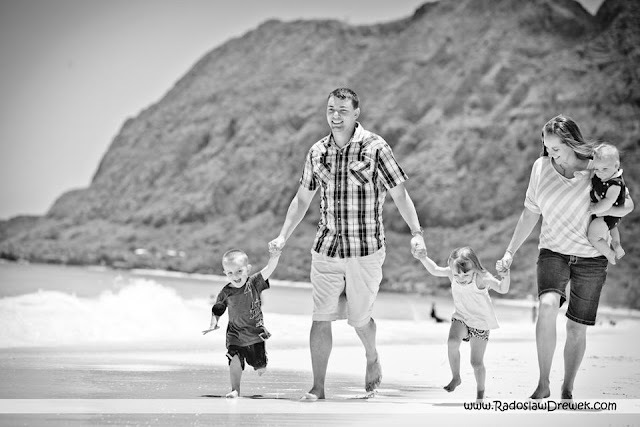 We will continue to have kids, and that will make the 'single parent' flying process a little more difficult as time goes by. That is why I am hoping to be stationed in San Diego after we are done here in Hawaii. It should be easy enough to throw four kids in a minivan to drive to Grandma's while Brad is at sea for months at a time. It will definitely be easier than taking four kids on a plane by myself. By the way, I have seen it done! I was stuck over night in the terminal at Travis AFB, with a woman trying to hop back to Hawaii with her four kids before school started. Her kids were six, four and half, almost three and fifteen months. I thought she was amazing, and her kids were very well behaved. I think that whole experience was a glimpse of what I will be like in a couple more years. :) Hehe. Great blog. 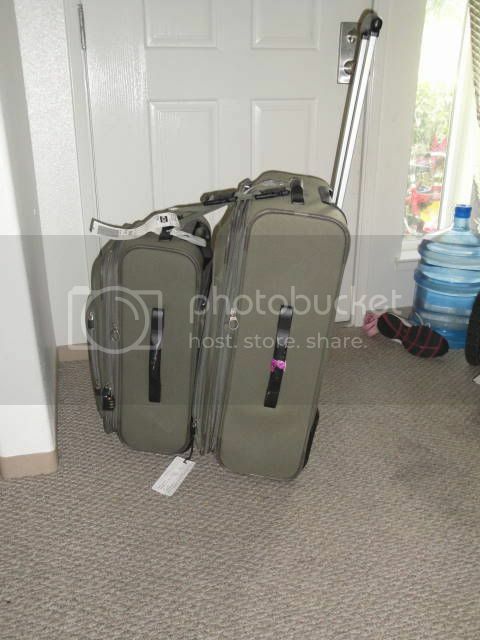 I think it is funny that you re-enacted the luggage situation for photo purposes, LOL. I especially like the plastic bag pic at the end!!! THANKS for this post! 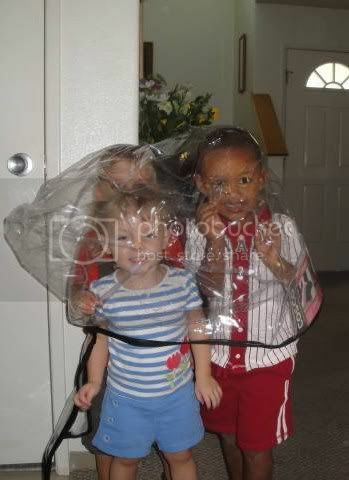 I am again amazed at how well you handle what is probably one of the more difficult things to do with children! Honestly, I can only hope that our measly trip a few states over goes half as well as your round the world excursions! So, you would recommend checking the stroller instead of gate checking it? I guess I am so afraid to check it for fear of something happening to it. The BOB is one of my prized possesions (sad, yes I know!). Thank you!! You have some great ideas, and we leave for Hawaii in three weeks so I'm glad you posted this! This was such a good post! I'm sure lots of mommies who haven't travelled much with their kids will find this helpful - I know I will once I have a baby!